Long ago there lived a young boy, about the age of seven, who struggled in learning to read and write. Despite the greatest of efforts, the work of learning letters bore him no fruit. Discouraged by the ridicule of his peers and the disappointment of his parents, with great pain of heart, the young boy retreated into the forest. As he walked along a heavily wooded path, the sight of an elder praying beneath the massive oaks startled him. 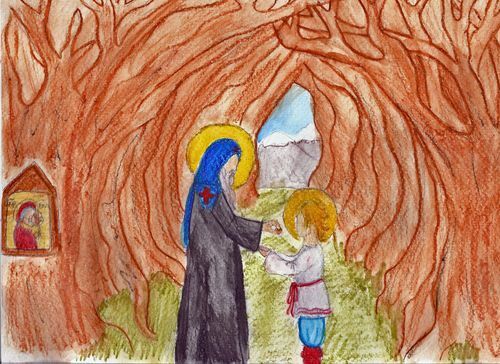 As he quietly approached the holy man, the elder turned to the young boy and immediately recognized that he was greatly troubled. Pouring out his pain over his lack of learning, the elder responded by offering him a gift of blessed bread, a sign of God's help, which he carefully pulled from a small pouch. Take and eat it. This is given to you as a sign of God's grace and for understanding of the Scriptures. By God's grace, he immediately learned to read and write with ease. All the days of his life, he used his ability to acquire knowledge as a means to acquire the grace of God. This young boy, Bartholomew, grew to be St. Sergius of Radonezh, the 14th century founder of the Holy Trinity-St. Sergius Lavra in Russia and the patron of our curriculum. Over the next several days we will be sharing a series of posts on our new curriculum, Letters of Grace, a complete curriculum for young children between the ages of three and nine. These plans will constitute the material that will launch our new Learning Through the Year of Grace website, due to make its debut sometime in late spring to early summer. Please don't hesitate to ask questions. The end of this project is in sight. It has been a labor of love. Beginning in January, our three families (Mary's, Emily's, and ours) will be giving it a trial run, testing the details of the plans with the tool of real life. Our goal is to offer a fully tested curriculum, intuitively organized and easily understood by the teaching parent and thoroughly enjoyable for the child and family. We hope you enjoy this tour of the work of our hands and ask that you pray for us as we work to contribute more towards Orthodox curriculum. And of course, all of the plans and printable resources will be available online free of charge. How wonderful! My little guy will be 3 next May and he'll be perfect to start next fall. Thank you!! Many blessings to you all for working on this project that will benefit so many families.